The San Diego Alliance for Marriage Equality (S.A.M.E.) 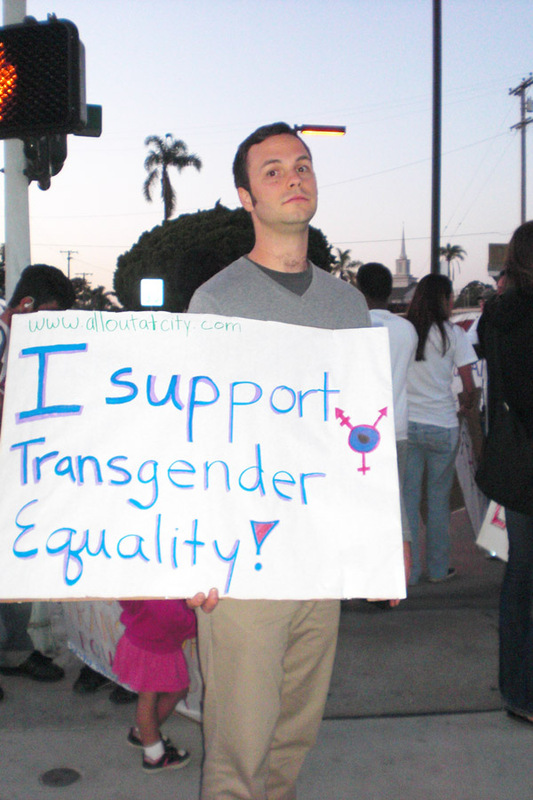 and All Out at City, the Queer student group at San Diego City College, drew about 70 people to a march and rally they staged outside the McDonald�s in Hillcrest April 30 in support of Transgender rights. 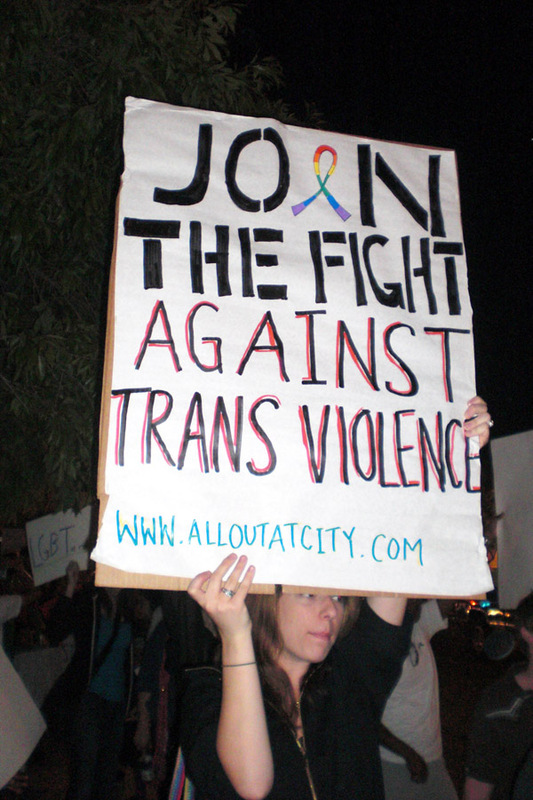 The rally was in support of Chrissy Lee Polis,the 24-year-old Transgender woman who was beaten up by two teenage girls in a women�s restroom at a McDonald�s in Baltimore April 18, while McDonald�s staff and customers looked on and only one person actually tried to stop the attack. One McDonald�s employee filmed the incident on a video-equipped cell phone and posted the clip to the Internet, where it �went viral� and shocked the conscience of many people who saw it. 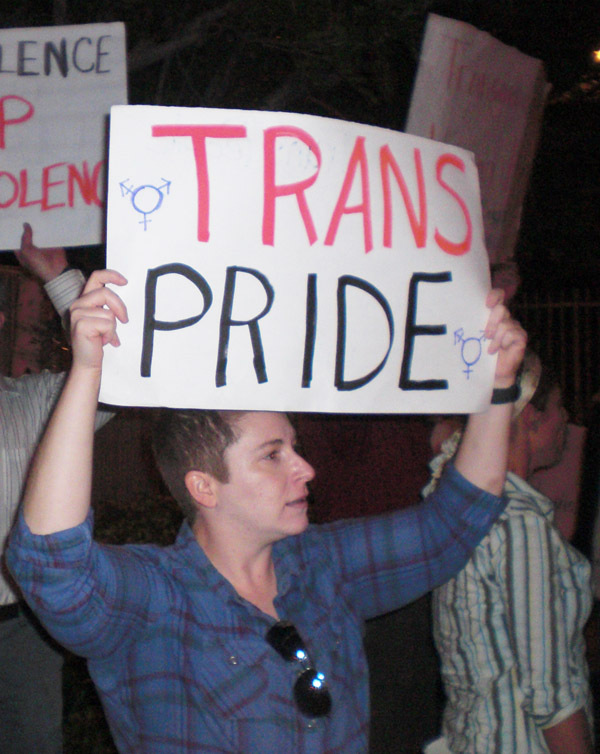 S.A.M.E., All Out at City and various individuals, many of them Transgender, seized the teachable moment to hold an event that held Transgender rights central to the overall struggle for Queer equality. Members of the San Diego Alliance for Marriage Equality (S.A.M.E.) 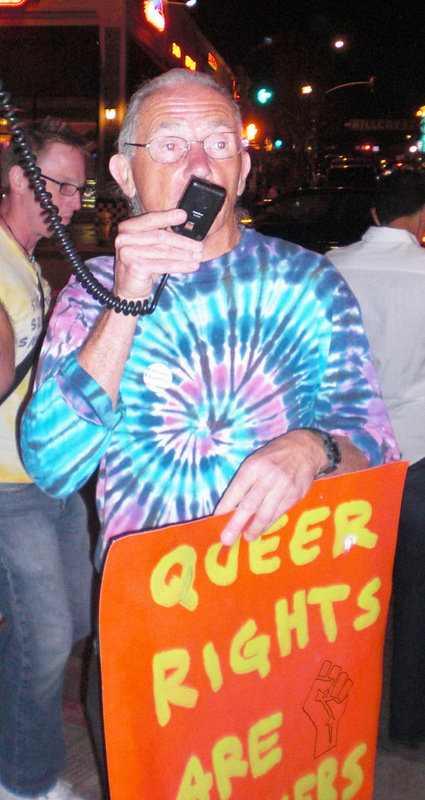 and All Out at City, the Queer student group at San Diego City College, staged a march and rally outside the McDonald�s on University Avenue in Hillcrest Saturday night, April 30. The action was in support of Chrissy Lee Polis, a 24-year-old male-to-female Transgender person who had been brutally beaten while attempting to use a women�s restroom in a McDonald�s in Baltimore 12 days earlier. The attack was filmed on a video-equipped cell phone by a McDonald�s employee who posted it to the Internet � where the recording went viral and shocked people nationwide with the ferocity of the violence against Polis. The April 30 event began with a picket outside the McDonald�s by S.A.M.E. 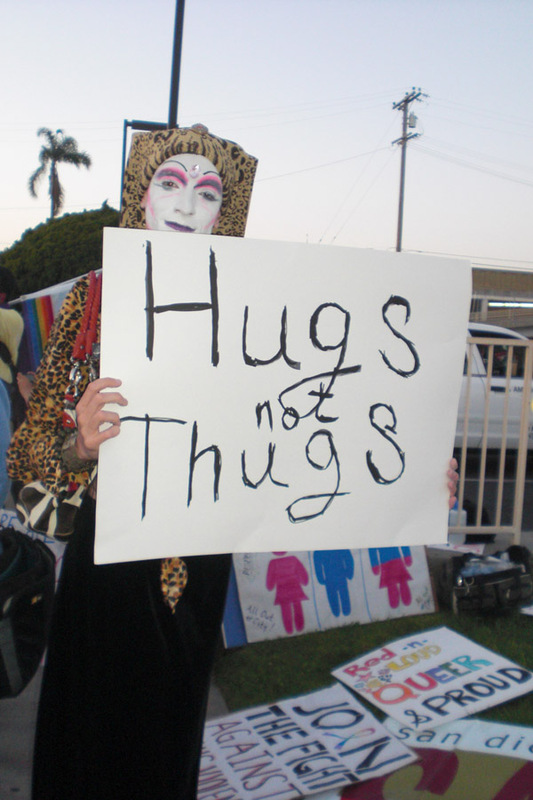 and All Out at City members carrying signs with slogans like, �No H8 on Our Streets,� �I Support Transgender Equality,� �Join the Fight Against Trans Violence,� and �Hugs, Not Thugs� � a contribution of a member of the Sisters of Perpetual Indulgence in full nun drag. Another participant held a sign thanking Vicky L. Thomas, a middle-aged woman dressed in a white pantsuit who was the only person who came to Polis�s aid while she was being attacked. The marchers circled the sidewalk in front of the McDonald�s and chanted slogans, then walked to Sixth and University for an open-mike speak-out and headed back to the McDonald�s at the end. 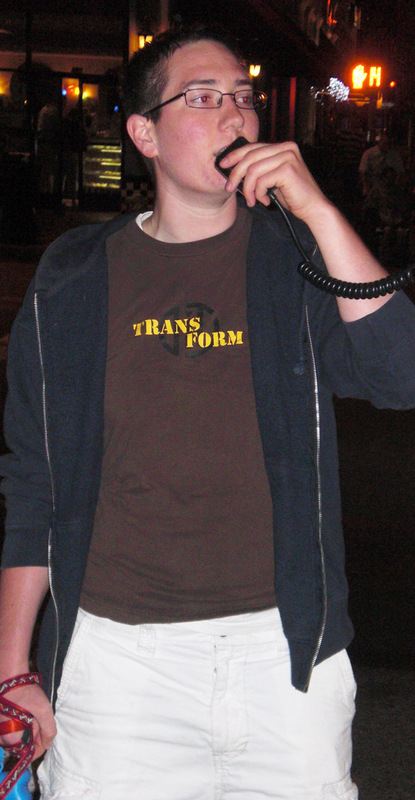 Another Transgender person, Liat �Red� Wexler � who had come to a S.A.M.E. 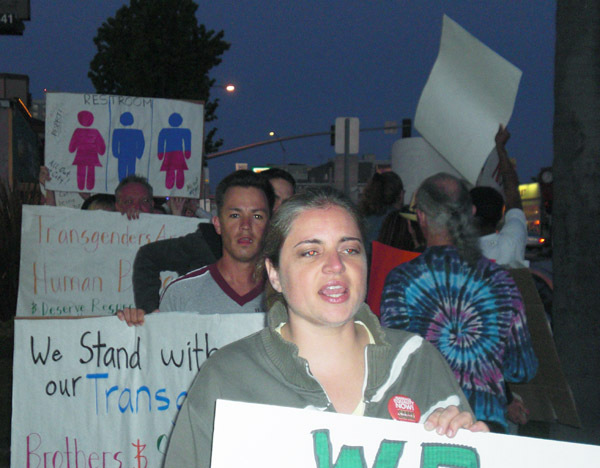 meeting where the demonstration was planned and self-identified as a �non-binary� (neither male nor female) Transgender person � stated that 90 percent of all Transgender people experience discrimination or harassment on the job. �This is not about Chrissy Lee Polis,� Wexler said. �What would you do if you saw this kind of violence? I would not encourage you to put yourself in harm�s way, but you should turn to other bystanders and call them out when they start laughing,� as some of the people in the McDonald�s when Polis was attacked � including the person filming the attack � did. �I�m Bi, and it doesn�t matter,� said Laurel. �I�m a human being first. When things like this happen, I lose faith in everybody� � but she added, coming to an event like the demonstration and seeing how many people are willing to stand up for Transgender equality and against hate violence made her feel better about people again. �There were people who thought it would be inappropriate for us to target [the local] McDonald�s,� acknowledged S.A.M.E. activist and Equality 9 member Cecile Veillard. �But I think it�s important for employers to take responsibility.� She called on people to continue to organize for the Employment Non-Discrimination Act (ENDA), which would ban employment discrimination against Gays, Lesbians and Bisexuals nationwide, and push for an �all-inclusive� version which would cover Transgender people as well. Polis herself spoke out about the incident in two videotaped interviews with reporter Kevin Richardson of the Baltimore Sun. She pointed out that she is epileptic and was in danger of having a seizure because of the attack, and only Vicky Thomas� intervention kept that from happening. She also said that the punishment didn�t stop with the physical beating; along with the video, her record of prostitution arrests was also posted on the Internet � which is only going to make it that much harder for her to find a legitimate job in the future.